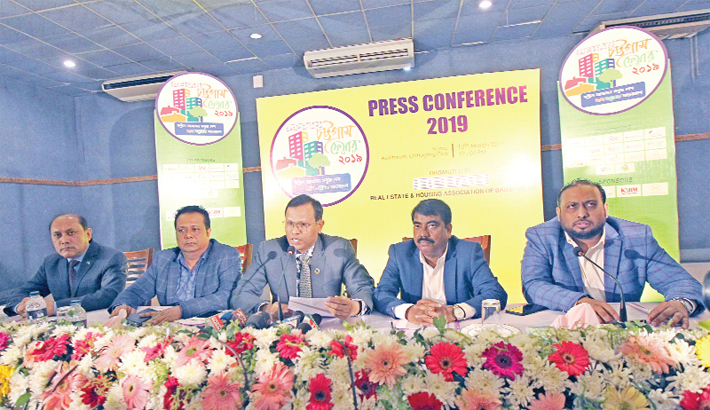 The 12th version of real estate and housing fair organised by Real Estate and Housing Association of Bangladesh (REHAB) begins in the port city tomorrow. Land Minister Saifuzzaman Chowdhury Jabed is expected to inaugurate the four-day fair titled “REHAB Chattogram Fair-2019” at hotel ‘Radisson Blu Chattogram Bay View’ at 11:30am tomorrow, said the organisers at a press conference at Chattogram Club on Tuesday. REHAB Vice President and Chattogram Regional Committee Chairman Abdul Kauiam Chowdhury read out a written statement at the conference where REHAB Vice President (3) and Fair Standing Committee Co-Chairman Kamal Mahmud, Director and Fair Standing Committee Chairman Md Shakil Kamal Chowdhury, Director and Chattogram Regional Committee Co-Chairman (1) Mohammad Didarul Hoque Chowdhury and Co-Chairman-2 Mahbub Sobhan Jalal Tanvir were also present. Vice President Kauiam in his written statement said as it is not possible by the government to meet the huge demand for accommodation with limited resources, REHAB with its 1,029 members is working as ‘development partner’ of the government to address the crisis. He observed that the industry is now passing good time in Chattogram as many came forward for investing in this sector. Referring the expense for registration in SAARC countries, Kauiam urged the government to reduce the registration fee in Bangladesh. “The buyers of flat and plots are reluctant to do registration due to the high registration fee and it is depriving the government of getting actual revenue from this sector,” he said. He also demanded for reintroduction of the section 19 BBBBB of the ‘Income Tax Ordinance -1984’ to check siphoning of money in abroad. “It is necessary to allocate an amount of Tk 20 crore for the private service holders and others for fulfilling their dream of accommodation as the officials and employees of the government and banks are getting long-term loan in a low interest rate in this regard,” said Kauiam. Putting up role of the sector in the country’s development, he said it has 15 percent contribution to the country’s economy growth while also ensured livelihood for two crore people through creating employment opportunities for 35 lakh workers. “If the opportunity for investing the undeclared money without penalty in the country is given, the investors will come under the tax net which will surely increase revenue of the government,” said the vice president. He also informed that they have set a target of bagging an order of Tk 500 crore from this fair where 5,000 flats and 2,000 plots will be displayed for sale. The organisers said a total of 56 firms will take part in 76 stalls in the fair this year. The firms include seven companies of building materials and 11 financial organisations. There are 17 co-sponsors in the fair that will remain open for the visitors from 10:00am to 9:00pm every day. Ticket price has been fixed at Tk 50 for single entry and Tk 100 for multiple entries. The 99th birth anniversary of the Father of the Nation Bangabandhu Sheikh Mujibur Rahman and National Children’s Day will be observed on the fair venue on Sunday.